The story of young Deogratias is one that is gut wrenching in its authenticity, brutal in its storytelling, and painful in its truthfulness. The horrors of Rwanda are exposed in a fly-ridden heap of human travesty, the stink of which is only seconded by the visual display of the pack of dogs feasting on the pile of humanity. DEOGRATIAS is an important story, detailing the darkness of a man’s soul and the apparent ease we humans have at killing our own based purely on physical differences. We read and watch as Deogratias decomposes into a beast, giving way to the hostile environment around him. There is hope, though not much of it. One man, his friend, the last bastion of understanding and kindness, offers to pray for mercy for Deogratias’ soul and for the power to someday forgive Deogratias. Despite Deogratias’ machete wielding, the man knows that even the boy is a “creature of God”. And there we are left with the story of DEOGRATIAS: A TALE OF RWANDA. If you are considering, pondering, or in any way experiencing even the slightest temptation to use this story in your elementary or middle school classroom, dismiss the thought. I would be very cautious – skeptical even – of using it with high school students. This is no ordinary graphic novel. I knew right away why First Second published it: This story deserves to be told, but not to children or teens. It is enough to send college students and mature adults straight to the bathroom for a scalding hot shower. We need to experience such realities so that we can understand the world in which we live and appreciate the power of making a difference beyond our city borders, but this story is for more mature audiences. The publisher and I differ on our age recommendations. The story is so powerful, so real, so current that I would not use it in a high school classroom except in very circumstances. 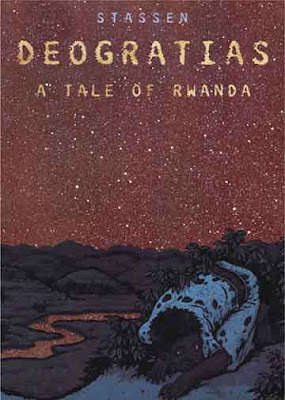 If I were to teach this book to college students, I would highly recommend a multi-literacy twin teaching of DEOGRATIAS: A TALE OF RWANDA with the Oscar nominated film, HOTEL RWANDA. Notice the discrepancy between the ratings? The American Library Association and the YALSA consider the book for young adults. Perhaps, I have been too conservative with my recommendation? I do believe the book deserves all the accolades it has received; it is incredible. However, I am not convinced this book is right for the high school classroom. Such differences are what make for excellent discussions and controversy. I would love to hear from high school teachers who have read it and disagree. Even better, I relish the chance to converse with a teacher who has used DEOGRATIAS in the classroom. That is what my comments section is for. Feel free to discuss and disagree.